Lindsay's Season So Far at Syracuse! 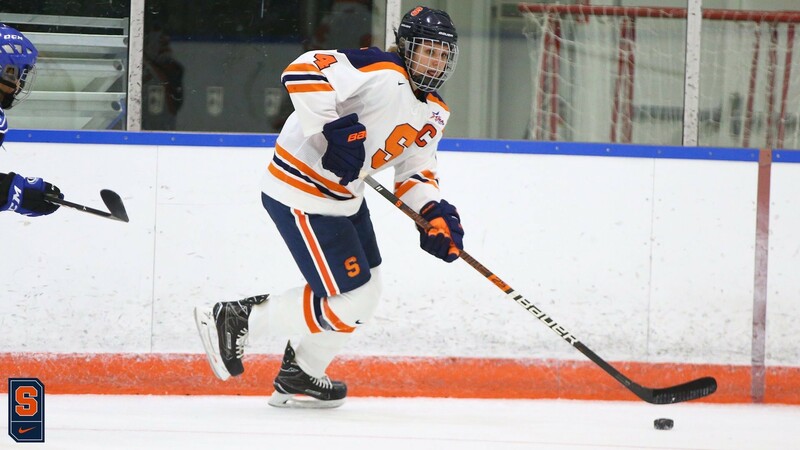 It has now been a few months since our summer intern Lindsay Eastwood left CARHA Hockey to head back to Syracuse University for school and the corresponding hockey season. We checked in with Lindsay to see how school is going, how the hockey season has been, and how she's doing in her new role as team captain! This first half of the hockey season and school year has come and gone quickly! As they say, “time flies when you’re having fun”, and that is exactly how this semester has gone. Hockey has been good so far, although, it can always be better. As I am in my senior year of University, things are actually starting to wind down for me academically, so school has even been enjoyable. The atmosphere on campus has been at an all-time high this fall as the Syracuse University football team was ranked in the top-25 for the first time since 2001. And of course both men’s and women’s basketball went into their season ranked in the top-25 as well. However, now it is our time to get in on all this ranking hoop-la and make Syracuse University a hockey school. We are 4-8-1 overall on the season. Despite our record, we h ave been playing well and coming close in almost all of our games. We have played a tough schedule against top-10 teams but have yet to take any of them down. We took #1 Clarkson University to overtime and tied #10 Princeton in overtime. Coming off a very rough 2017-18 season, we have really turned things up this year, with much higher expectations. Both on the ice and off the ice, the team culture has improved a tremendous amount. The Syracuse women’s hockey team is headed in the right direction. This year I have the honour of wearing the “C” for my team. I am co-captain with my defense partner and best friend, Allie Munroe, and we are assisted by our roommate Brooke Avery. Together we have been working at keeping the team moving in the right direction by living by our core values that shape the team culture. Now, I wore the “A” last season and I have been team captain of my junior team before coming to SU but this is the greatest honour I have received yet. Being a leader on the team comes with a lot pressure and responsibility even greater than in high school, it is nice to have the leadership team to work together with. On-top of all this, I am also on the executive board for the Student Athlete Advisory Committee. As a committee our role is to enhance the student athlete experience at Syracuse University. I volunteer within the community as well as attend and setup events for our student athletes. I have been able to make new friends and get to know other student athletes much better through SAAC. I am so excited to see where everyone winds up in the next couple of years including myself.